To leave Afghanistan by an overland route, our plan was to dress like Afghans and keep low profiles. For the ride on a public bus, US Army Rangers suggested that we buy weapons at the bazaar. They said, "Nothing fancy, just Russian-made pistols for protection." 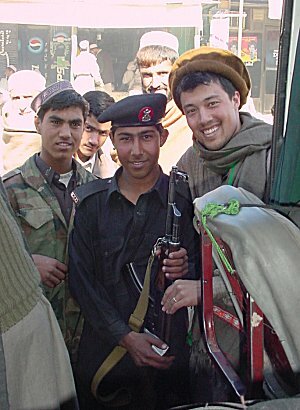 We thought our best protection was to impersonate Afghans and blend in with the crowd. Before first light, at 5 am, we hailed a taxi to the bus station and embarked on a bus bound for Pakistan. Potholes, gravel, and bumps shook the bus and caused several passengers to vomit. Jill covered her face beneath her chador while I imitated an Afghan and dressed in the local garb; we sat behind people and stayed out of sight. On Kabul's outskirts we crossed several checkpoints. Our disguises kept us hidden and the bus driver looked relieved that he didn't need to help us get away from bribe hungry police. Police or militia stopped our bus many times. One group, armed with tripod machine guns, sat around a tent atop a small hill. They flagged down our bus, jumped aboard, walked up and down the aisle, but failed to notice us hunkered down in our seats. 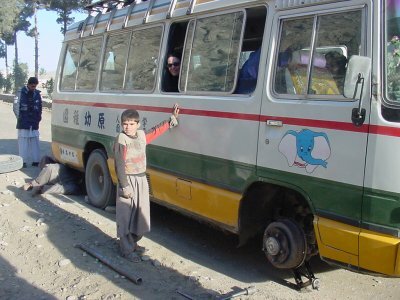 Then the bus blew a tire in Sowibi, "outlaw country" as the US Army calls it; this is where many robberies have occurred that are supported by a local warlord who stirs up the population against President Karzai's government. Nine hours wiled away as our bus crawled to the border. Along the way we saw abandoned military equipment, burned out tanks, armored personnel carriers, old artillery pieces. Our biggest problems continued to be of the low tech variety. In Jalalabad we hit a donkey. The collision jolted everyone forward and caused a skid stop. The poor animal limped away in shock. The driver and donkey owner shouted at each other for ten minutes, curious soldiers watched, we sank low in our seats; so much for keeping a low profile. At the Pak border a guard joins us, a mandatory companion for foreigners. Pakistan calls this area the Northwest Frontier, tribal lands loosely under control of the central government. Our guard looks as if he's fresh out of bodyguard school. 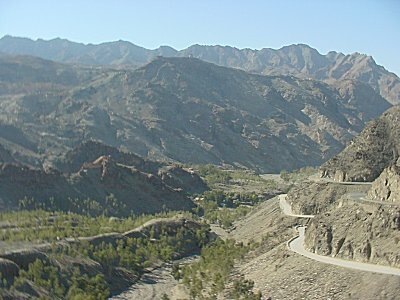 Kyber Pass - the traditional entrance to Pakistan for Westerners. Every invader since Alexander the Great has come through this gateway to Southern Asia. As always, flat tires always happen at an inopportune moment yet this kid doesn't look like much of an outlaw. Squeeze yourself and bags into an autorickshaw. This is the cheapest mode of travel in Peshawar, our first stop in Pakistan.